Personal preparedness is the foundation of community preparedness. Knowing what steps to take in an emergency can help you preserve lives and property until professional responders arrive – and self-reliance and self-confidence are never bad qualities to have. DEM and our partner agencies offer several ways to become involved in local preparedness activities or to receive low-cost or free training. DEM coordinates Lexington’s Community Emergency Response Team program. CERT is a national initiative whose goal is to develop neighborhood teams with the skills they need to help themselves and their neighbors if a disaster occurs. 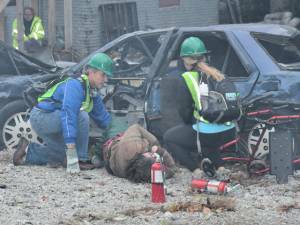 During a large-scale event, a CERT team can provide neighborhood assistance until professional responders arrive. CERT training is an eight-week curriculum that covers disaster preparedness, first aid, fire suppression, disaster psychology, light search and rescue, natural disasters, terrorist incidents, and team organization. The class culminates in a hands-on disaster simulation. For more information on CERT, including how to sign up for the next class, see our CERT page. CERT team members from Lexington’s Class #15 assess and treat a “victim” during their final exercise (photo: DEM). The Lexington-Fayette Urban County Division of Police and Division of Fire and Emergency Services respectively operate the Citizen Police Academy (CPA) and Citizen Fire Academy (CFA). These community education programs teach citizens about the skills and duties of Lexington’s police officers and firefighters and the structure and history of their respective departments. For more information on CPA, visit the Division of Police’s CPA page. For more information on CFA, visit the Fire Department’s CFA page. Throughout Fayette County, hundreds of businesses use hazardous chemicals in their daily operations. More chemicals move through the county along the interstate highways, rail lines, and underground pipelines. Fayette County’s Local Emergency Planning Committee (LEPC), organized by DEM, is a community education and planning group focusing on the safe handling and storage of hazardous chemicals and the rapid and effective response to any accident involving them. The LEPC is a public sector-private sector partnership of police, fire, public health, and emergency management officials, media representatives, and members of Lexington businesses and educational institutions. For more information on the LEPC, visit fayettelepc.com. Under a special federal charter, the American Red Cross (ARC) is the United States’ lead volunteer agency for disaster relief. Red Cross volunteers handle a wide array of tasks, from educating their communities about preparedness to managing relief shelters for displaced citizens. The Red Cross also delivers first aid and CPR training, providing thousands of Americans the basic skills necessary to save lives. For more information on becoming an ARC volunteer, visit the Red Cross Bluegrass Region’s home page. To see upcoming classes near you, use the Red Cross’ class lookup tool. 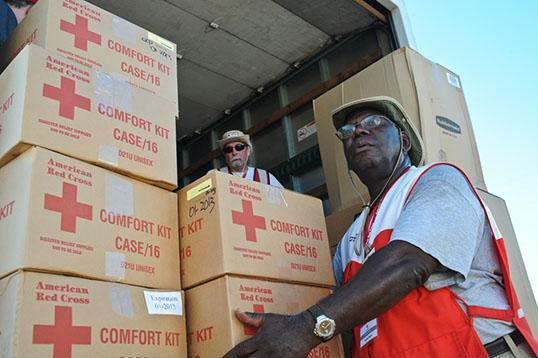 Red Cross volunteers from Massachusetts unload relief supplies in a Gulf Coast community affected by Hurricane Isaac (photo: FEMA). The Medical Reserve Corps (MRC) is a federal program under the US Department of Health & Human Services. MRC volunteers work in community-level units to support public health through emergency response, health education, and preparedness activities. Volunteers also can choose to be deployed nationally as part of large-scale relief operations. The MRC works closely with the Red Cross, the Federal Emergency Management Agency, and state and local health providers. For more information on becoming an MRC volunteer, visit the home page of Lexington’s local MRC unit. The Civil Air Patrol (CAP) is the official civilian auxiliary of the United States Air Force. The missions of CAP’s volunteer aircrews and ground teams include search and rescue, disaster relief, humanitarian supply transport, Air Force communications and survey support, and aerospace education. For more information on CAP, visit the Kentucky Wing’s site or the national CAP site.